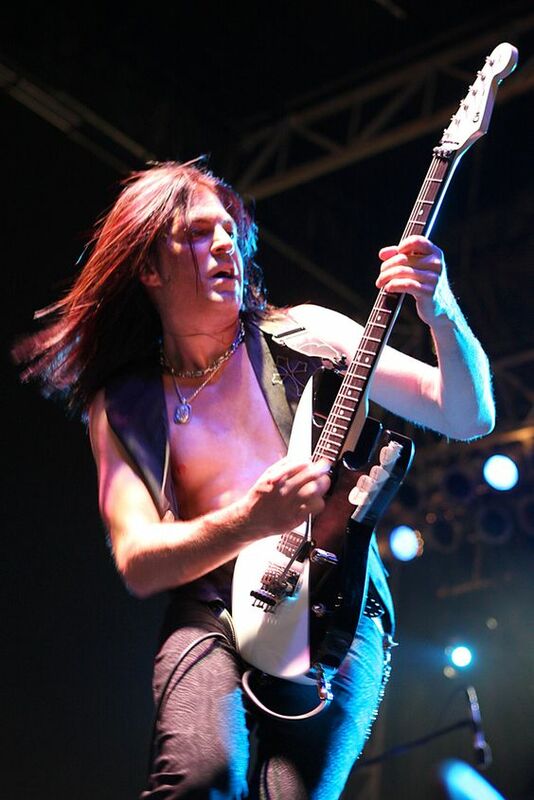 Jon Levin - Rokken with Dokken's Axe Master The Interview - Welcome To All That Shreds Magazine! My first interview for my website is with Jon Levin. Jon is the guitarist for Dokken. Jon was very gracious with his time and was an excellent person to speak with. I’m very proud to have Jon Levin from Dokken as my first interview! Thank you Jon and good look on the road! Jon, thank you very much for this interview. You’re going to be my first interview and new launch off my new website. With your background being an attorney, a guitar player for Dokken and all that, you have quite a story / history here. Cool, Right on! Fire away man what do you want to know?? Basically, I know you’ve been in Dokken for about thirteen / fourteen years, and I know you started playing piano as a kid and all, for people who do not know you, how did you end up trying to play guitar for the first time? That’s a good question. Well I started out with the piano, then I went violin, then trumpet and actually, I wasn’t very good on piano or violin but I was a good trumpet player and that was like in third or fourth grade. Then I found I knew I was into music somehow. Then I went to a friend of mines house and he had this electric guitar a very inexpensive old one you know and a Peavey little amp and this Beatles book The Beatles Complete and he didn’t play it at all and then I started monkeying around with it and realized we had this old acoustic guitar in our basement that was once my mothers and it as just lying around down there. So I started learning how to play a few cords on that and I took a couple lessons I remember, then I took to it quickly and I forgot about the horn playing after that. Once I discovered the Beatles, I discovered the Rolling Stones and that was when I was completely hooked once I found the Rolling Stones. With the Stones did you progress with the guitar? Did you get into Clapton or any of that era there before getting into Randy Rhoads later on? Totally, I started out in my earlier years when I learned how to play I learned how to play like Eric Clapton solo’s. it’s funny you should have mentioned this cause just two nights ago I pulled out — I have a pretty good memory when it comes to music, not always so much for names and places but for music I can remember things just like uncanningly. I just pulled out the guitar and I started playing the Cross Roads solo I knew it pretty much note for note when I was a kid and I remember how to play it now. Funny you should mention that because I haven’t played that guitar solo in probably 30 years or more and I was playing that just the other night. Yes, I got into Clapton and he was the first major influence when I was a kid. I learned the Crossroads Solo, I learned Sunshine of Your Love, then I learned a couple Hendrix things. I got into Hendrix. When I was a kid, I would try to play these things as closely as I could as be opposed to ‘sort of’ doing it. I actually really got into it and from there I found, of course, Randy Rhoads, Eddie Van Halen – went down the gammit… Ace Frehley, I was a Kiss fan too when I was kid that was a little earlier. That’s what I was going to ask you, did you get into any Kiss at all or Sabbath? Totally Kiss, when I was a kid I remember I had the giant Kiss poster in my room. You know the one of Ace with the smoking guitar? I don’t know if you remember that but I had that in my room when I was maybe 14. Yes, I was a baby back then. You know there were other influences too, I played a lot of different things when I was a kid. I had a phase where I was really into Lynyrd Skynyrd. I learned how to play a lot of that stuff. Then I got into Judas Priest for a while. I was sort of all over the place. I have phases where I would really get into particular records, you know we had records back then, vinyl and I would just like beat it to death and then I’d somehow get onto the next thing and go to that. I went through many phases and it altered my ability, it altered what I wanted in terms of musical gear too you know. What were you using? We’re probably back to the late 70’s probably early 80’s when EVH and all the guys were coming around what kind of guitars where are you using at that time? In 1979 I got my first real Gibson Les Paul custom, it was a gift and I still have it today, I’m the original owner I still have that. That was my first real guitar. Back then they were inexpensive toy type guitars I had a Univox hi flier that was my first electric guitar. Then I got the Les Paul and then I bought one of the early Charvels in early 1981 – 1982 right around there one of the original ones. I still have that also. So it started out on the Gibson for a while. Once I found the Charvel then I knew I liked the ones when I was kid once I sort of latched on to that I went for a bunch of guitars. Then I went veered back when I got a little older early 20’s I went back to the early Gibson and Fender and I started playing vintage instruments. Back in Long Island. I was reading that you were playing the club scene in your late teens and early 20’s, was that typically a hard rock band? where are you playing some different music? how did that come about? That was a hard rock band called Devias. I went to college for two years and I found this singer whose name is Frank Vestri who’s really a nice guy and we started a band together then I decided to drop out of college. So I dropped out of college and started a band with him and started playing Long Island clubs. There was a bass player that we played with his name was Greg Smith he was an old dear friend of mine who went on to be in many bands from Alice Cooper to Ted Nugent, he’s been in a ton of bands. That happened when I was a kid, he was a little older than me and he was in a bigger club band called Cintron – I went on to play for him and it was a bit thrill for me, so we got into a club band together did quite a number of dates that was where I developed my ability to play concert and start focusing more as a professional, the transition from just bedroom to taking it to stage. When that ended, did that end on its own? You said he went to another band? Did that end, did you guys actually blossom out together? You’re asking a really good question. Ok here’s what happened. we had a deal with Capital. we got offered a record deal, they said if we had a keyboard player on stage we were signed and it was Clive Davis who was going to sign us but for whatever reason, we did not want a keyboard player in the band so we didn’t end up doing that which we probably should have, we were jerks back then, I don’t know what we were thinking. Tommy Hendrickson who is another dear old friend of mine, saw me play one night when I was in a club and I got a call one night from one of the producers, from Tommy actually telling me he was in warlock and they needed a guitar player , I’ll never forget this, I was 21 years old, the early twenties, and then he said to me , I want to tell you, I know you’ve been in club bands , I remember exactly what he said, “when they tell you something in this band, it happens and he was doing videos and touring and doing it on a real level where I was still in the clubs and I said to him alright let’s make this happen, so I met with him, I started learning songs, I went down and played with Doro. Then I got a call the next day from her manager Alex Grobe. I didn’t know who he was and he said, can you come to my office in Manhattan and I did that and he offered me the job and I took it. Then when I was 22 I made my first record with Doro and did my first European tour that summer, which was. I think I was 23 when we toured it was 88 we made the record in 88 and we toured in 89. I remember that video being on MTVs Headbangers Ball, I was 16 years sold seeing you for the first time. I remember you vividly because Doro was a warlock and her playing under her name, then warlock, and I remember bobby rock was in the band too if I am not mistaking? The videos I was in was in was hard times and whiter shades of hail they were both played a lot, they were played heavily on MTV back in the late 80’s. No Bobby Rhondonelli. when I was a kid my very first concert I saw was when I was 15 at Madison Square Garden was Rainbow and Scorpions, Bobby Rhondonelli was the drummer in Rainbow and he did this 15-minute incredible drum solo so for me to be in my first situation with Tommy Hendrickson and Bobby Rhondonelli we made for a great band, it’s one of the best things I’ve ever been in. What happened with Doro and you, did you move on to greener pastures? how did that end? When you were with Doro, just kind of getting technical here. what kind of gear where you using at that point and time? Was it endorsements? Yes, my first endorsement I got in 1986 with Kramer guitars. I didn’t have anything happening at that point. 86/87 I was just in a club band 20 or 21 years old. I sent in just a tape that we did and they called me because they liked the way I played and said we’re going to endorse you and they gave me my first endorsed guitar and I had a good run with them they were very kind to me. For amps I remember I was using the Marshall 50 watt, 2205 model it was the first channel switching Marshalls they had it’s the same amp that Michael Schenker used 2205 and I liked them, I had four of them 2205s and I had one 100 watt one that I got from England, actually when I was a kid my parents went to England and sent me one of the amps from London it was a great one too and I used those amps, I use the 50 watt version of those when I was in Warlock, you know with my Kramer Beretta with no effects .. I plugged straight in, I think I had a graphic EQ that I ran through the ??? and that was it. literally, no pedal nothing, I just played direct and I did that for many years and even through the Dokken days I didn’t start even putting a pedalboard together till after I was in Dokken probably for 3 or 4 years, the first 3,4, or 5 years maybe I just played straight direct into the amp with nothing. Wow! yeah, now I have a couple effects I use but they’re very minimum. Yeah, the Dokken stuff that is the next on my list. When the Grunge scene came on with the Pearl Jam and Nirvana and all that, did you. I read the other articles where you said that guitarist position was pretty much DOA because everyone was in flannel and Hollywood and whiskey and go – go and sunset strip and everyone pretty much retired at that time was that the main reason you decided to attend law school how did you go about reaching that decision? You know that was definitely a big part of it and there were other outside influences like my mother passed away right around that time, and I think that really once that my mother passed away I sort of gave up the music thing mentally and it was that and the combination of my not being able to see past the grunge thing the lead guitar thing was over at that point I wasn’t thinking it was ever going to change is it going to come back? who knows? I just had to do an about-face at that point, I got into some sort of panic mentality where I saw a job-making nothing from life, there’s no guitar playing thing anymore, I don’t do this grunge thing, you know what am I going to do? It got to that and for reference, I did quite a few number of years where there wasn’t much lead stuff, it went on for a long time. Right, you’re absolutely right. that went on for a long time… You graduated later from law school, I believe it was 1996? When you got out of law school, you started practicing law and then the music industry and you had your own record company if-if I’m not mistaken. Yes, that is exactly right, I started out right away and I had a record label with my friend Brian Landau who had worked for Electra for ten years at that time we started a record company together. What did you do, did you sign anybody of notoriety or did you just kind of keep it to one side or specific genre or music like music contacts? What did you do? We did we had a couple of bands, we signed a band called The Dead Life. We got a deal for them on Elektra and we had another band called the Eccentric Sound System, I think was on Sony so we put out a few records and the label was actually doing well but then after this, there goes the music industry. That brings us up to the late 90’s, like 98-1999 that’s when Dokken started kind of coming in the fold for you 1998, did you start, was that when Jeff Pilsen told you to come down and jam or was that more towards 2003? How did everything come about with Dokken? Was that the conversation you had? Yes in April or May, around may of 98, Jeff asked if I would play some solos for him, he had left a message on my office voice mail. He didn’t mention on that message that it was for Dokken, because had he done that, I probably would not have never done it is — at that point, I hadn’t really played guitar from 93/94 or all the way to that point, I played guitar just occasionally it was like in my brain over… so it was my dad, I heard the message at my father’s house, I was having dinner at his place. I would still dress in my work clothes on that day, I remember, it was a suit and I checked my messages and mentioned to my dad, ‘I just got a call from someone who asked me if I would play and he was like ‘DO IT’ so I said why? He’s like ‘go and do it’ and I remember it was so much, it was raining that night and I was dressed in a suit and I’m like, “I don’t want to go” my dad pushed me into it. So I drove down to Redondo Beach then the studio door opened and this is how it happened, “literally the door opened and Don was there and he had a Les Paul in his hand and he put the Les Paul in my hands and I think he was skeptical he was just like here, play and you know, knowing now, I think he must have been skeptical, I mean who wouldn’t be skeptical. How many people were at the Star Plex show? was that an arena or a club? It was a typical outdoor amphitheater; it was a large amphitheater. I would say it was somewhere from 15 to 20,000. So during that time between then and 2003 were you still practicing law or were you still filling in for Dokken ? Oh yes Between 1998 and 2002 actually not even 98, I think between 2000 and 2002 I did about another dozen or so shows just filling in when they needed somebody and it wasn’t really ever discussed about me joining until one day I got a call from Don in winter 2002, he called me in the winter and asked me to fly out to where he was, and once he asked me that I thought hmm , this might actually end up happening actually and it did! You kind of had a jest this was going to be happening and you knew he was going to ask you to come on board, full-time, I would imagine at that time? I didn’t know for sure but I had a feeling that it was somewhat headed in that direction. Ok, so Don asked you to come aboard full time. Did you put your law practice on hold while you started working with Dokken on the record in 2003 or did you? No, I didn’t have to because at the time 100% of my law practice was entertainment law, and when I say entertainment, music, I’m a music attorney. As a music attorney, all of my work just put on a computer and a fax machine at the time and email. So I actually from that point up until 2008 when we would go on the road, I would just bring, literally all my law stuff with me, I’d bring a brief case, a little portable printer, my laptop, I had a modem, a portable modem and I’d work from the back of the tour bus or in my hotel room. Wow, that is awesome! That’s really good. When you started recording with Dokken in 2003, where you a little bit apprehensive you know coming in after George Lynch, I know you said he was an inspiration to your playing — I do believe. Was it hard filling in for that or was it pretty easy for you? How did you handle that? You know for some reason; it didn’t bother me at all. I think it was because you know how I was telling you earlier I had my phases where I listen to like Lynyrd Skynyrd, Judas Priest , I had a very long phase of being, I mean a Dokken phase it was a very long phase for me, I was this George Lynch fan, you know, they were really my favorite band for a long period of time so for me it was a really natural fit, I didn’t have to force it at all, it never really struck me as trying to put a square peg into a round hole or anything, it was just a proper fit for me and I think that’s why I just always felt comfortable with it. OK, I was going to say, when you debuted in 2003, die hard rocking fans accepted you and have said nothing but positive – high praise for your playing and I have not heard anything negative about you. Every Dokken fan I’ve known has said that you blend in with Don and the band and mix magnificently. It’s awesome, that leads to my next question. The Dokken albums that you’ve played on and I’ve told you that you sound amazing with the great guitar work, how different was your gear when recording each album? Completely different from each record, do you want me to tell you specifically what it was, I can. I mean yes, if you can go into details because the guitar nerds that I deal with. this was a question they wanted me to ask you, what kind of gear that you were using. Yes, sure! For Hell to Pay, we did that in total access, we did the whole thing in the studio, from what I recall anyway, at least all of the guitar parts we did basic track in the studio and I know I did also all my guitar parts in total access as well, I’m not sure I think Don may have done some of it in his studio and for that record it was my JCM 2000 head, an actual. yeah, we mic that up, I used different guitars for different stuff. I used my ‘57 Les Paul for some of it. and then for all of the solos on that record were from an amp that Don had that’s modified, I think it was a 100 watt Marshall with snakeskin around it and all of the solos with that were with that and I think my Kramer Beretta’s. From there on Lighting Strikes Again, I did a lot of that in my studio for my part, not all of it but a lot of it, I mean we actually used a few different places for that, we did some in total access, we did some at another studio up in the hills in Hollywood here and then Don did some at his place and I did some at my place. So for guitar sounds all that was rhythm was I used my JCM 900 in my place, one day Wynn Davis just came here and mic’d up a cabinet in my house, and we bought this thing called the hotplate? it was like a tower attenuator so that basically allowed me to crank the amp all the way up so it sounds like the warmth of a cranked up amp but it wasn’t blasting my neighbor’s head’s off(laughing). so I wasn’t really getting that speaker push it was nice. My JCM 900 was a tube screamer that was that entire, all the guitar sounds are all of that and that’s more of a retro sound, I wanted something a little more that I would fit in with the Dokken catalog a little better. Then we did Broken Bones , that I decided I got tired of , I didn’t like having time pressure to do my leads and it seemed like that was would always end up happening because you know it’s expensive when you’re on the clock and I didn’t want to just be like ‘Johnny on the spot’ throw a quick solo down on the first , as soon as they get something that somewhat works , that’s like good enough and lets do the next one — I didn’t want to do that, I didn’t like doing that and that’s how I did all the other stuff and at that point, so for Broken Bones I actually got this thing called the ‘Eleven Rack’ and had an engineer come and set me up in my studio and I was able to just record solo after solo with this thing called re-amp track . So we weren’t so much worried about tone, it didn’t really matter because after I had done when we went to Mick, I was able to run my signal back to anything I wanted. Do you know what I mean? Because there was a direct signal running, printing at the same time as the actual tone all at although it turned out at the same time That sound I created on the eleven rack and I borrowed this guitar, I knew I wanted to use the sustainer? for something on that guitar on that record that I borrowed from Fender , yes Fender endorsed it , they loaned me a guitar that had a stain mechanism in it, it was one of Phil Collen models , yeah it was nice, it had incredibly heavy strings on it and when I got home, I just plugged it in and played a few solo’s with it on those incredibly heavy strings actually more than a few, I took half, maybe half the album and just had a moment of inspiration with this sustainer on this guitar and I like a lot of what I did but that, unfortunately, had me locking into doing almost the whole record with those incredibly heavy strings and it really bothered my hands after a while but if you ?? our want to use these parts you do realize you’re locked into this , you want to make a teensy change you have to use that exact guitar so that happens and I actually ended up really liking the lead sound I got and a lot of the rhythm sound too I think for tone wise I am happiest with some of the tracks on Broken Bones with the rhythms some of them are re amps and also incorporate my original eleven rack sound almost all of it is that. I was pretty happy with how that went and its basically what evolved. The Broken Bones album, I think between you and Don it felt like you guys were probably the most comfortable of the albums you guys had done together just seemed like you guys, just the flow was there. the music was. Yes, it was, that’s how it went down when we recorded it like that it was amazing, that translated like that because before we did it you know for some reason when we did that record it felt all along like we were doing something that was just going to be really great you know. When the album came out, Don said it was going to be the last Dokken album is that pretty much carved in stone? You never know, we’re talking about potentially doing another one now. Don and I both always did this for the art we love making music and we love to play and we like to collaborate too, so it was always about that and not so much about anything else it’s the bureaucracy of the record business and all that neither of us really love that you know I guess it’s just part of my only problem with it and I know Don feels the same is you spend so much time pouring your heart into these albums that there’s really no outlet for record sales anymore or even to really have it heard there’s just no industry left . You spend so much time on it and you really can’t sell it and then you want to hear it and just hope people are able to hear it on YouTube so it’s just that, you have to somewhat do it for no reason other than you want to write or play for yourself because it’s not like it was back in the day when there were real record labels and you know there was a lot going on. There are no record stores anymore. John, you actually jumped ahead of questions here of mine and I’ll just get right to this, with you practicing law and the music industry I would love your opinion about the YouTube situation? Their compensation bands have many people angry about that Nikki Six is leading the bleed on it and being very vocal about that , that’s something I started studying about and listening to You Tube it’s kind of like Spotify that you’re really not getting compensated for it as an artist because if you have like an end user account like me because I’m a journalist or as a fan and I got one of your videos that if I saw you down here in Orlando at The Hard Rock or you know and I’m playing that less than two minutes , how do you feel about that or what is your opinion about that do you feel that artists should be properly compensated ? If so how do you think that YouTube should police that? You know I got to tell you that I really don’t have an answer for that. As far as the music side of things, I always just did it because I love music as far as what it really is. At this point in my legal career the original music law left, you know I’ve veered into other things at this point so I don’t know that I have a definitive opinion on it. I’ve just always thought that the only real reason to play music is because we love music and you want people to hear music I always felt that if it’s simply for money or business then do something else. I don’t want to put words in Don’s mouth, but I’m pretty sure he feels the same way. It was always about the music because you love making music and you want to do something great and hopefully the money follows. You know, look, people need to make a living and you have to hope that the money will follow but that’s not a priority in the reason to do it I don’t think and the reason to do it is because you love making music. I think that anything that can get you heard is a good thing that’s my whole thing with not wanting to make records so much, it’s hard to get it heard and any vehicle that you can access and use to get your music heard is a great thing for the artist. There’s plenty of other money you can make in touring and other facets but it’s all got to start with getting the music heard. I’m from a concern that you know ten or twenty years there may not be anything left, the music industry to me is just dying out largely. The new bands now, like you said back in the 80’s where we had large budgets for bands, we could spend half a million dollars on videos that are just not the way now and a lot of these bands are touring for a couple years at a time because this is how you guys are making a majority of your income from T – Shirts to concerts and other revenue like that because you can’t get any money off of I-tunes or some of the other places. Yes, it’s really a catch 22 because the only way a new band can make money is if you can tour but you can’t tour until you have a name that you can sell tickets, it’s very difficult. That’s the reason for exactly what I was just earlier saying that I’m concerned that a lot of the industry is going to strain even more because new bands can’t find a way to break out. It’s a catch 22. Going back to your Charvel signature series guitar. I remember Charvel was talking with you about launching that. Did it sell out? No, they’re out and also they sold all of them. That’s what I thought because I can’t find one anywhere. The deal was they wanted to make a limited amount of a custom signature model and they made them and they all sold pretty rapidly and that was that. Maybe they’ll do more, I haven’t really discussed it with them since, I’m sure it will come up at some point. Your signature series had rave reviews about it and all. Yes, they came out and really knocked it out of the park. They came out unbelievably. I was really happy about that. I wish I could have played one, I didn’t. With the younger generation that we have of guitarists and bands and all that was there any guitars that you might have heard that you know that you like or some of the other shredders that you could pass the torch on from musicians like yourself that have been playing for so long and you’re playing in a band like Dokken is there any one of the younger guitarists out there that have caught your eye? Yes, there have been a few actually, let me see if I can pull up names. Frankly one of them was someone I saw, I found on YouTube and it was this young kid he must have been his early teens and he just had an incredible feel. I wish I could recall his name but I don’t. You know there’s another younger guy, he’s a little older he’s in his early 20’s Brandon Paul, he’s in his early 20’s, he’s a great player and it’s great to see someone in their early 20’s perform. I think it’s great because you don’t want to see this art form die out. cause I hate to say it but today’s kids I hate to say it but they play video games. Are you using primarily Charvels now when you’re out on tour with Dokken or are you mixing them up with your old Les Pauls? What are you using these days? I still pretty much use all the Charvels I have a bunch of Les Pauls, it’s really difficult, it’s become harder and harder with the airline situations. I don’t like to check guitars so I carry it on with me. Now these newer planes I just flew just recently and the brand new plane doesn’t have a bin that is big enough to even hold the guitar and now that’s concerning, so you know just the old Gibson thing is I love my Les Pauls but they’re not really conducive to doing this job. At my point, I don’t really want to deal with having to tune mine. There are enough other things to do without having to deal with it. I try to keep it simple. I love my Charvels and they stay in tune with the sound great so I just stick with that. I love my Les Pauls too but those stick more home or in the studio. Although I have brought a Les Paul with me in 2004 I took one with me. Do you enjoy touring? do you like being out on the road or do enjoy more being at home around LA? I love playing the show, I love playing. The traveling element of it I can do without but that is just you know you have to suffer through the grueling traveling schedule to do what you love to do. Nothing comes without a price you know I don’t really love the traveling but I love to play so in order to do what I want to do I have to deal with traveling. Do you enjoy meeting the fans? Do they treat you well? Like at the meet and greets? John my last question is do you have any plans for putting a solo album out with your work? Maybe going the Mike Varney way? You got the talent! Thanks, Man! You know frankly there’s a whole lot of other facets of how I play that really aren’t exposed in the Dokken situation so it’s not something I oppose to but what I’d be opposed to is just anytime I’ve ever heard anything instrumental just for me for the 99% of it I just find incredibly boring so you know that’s just sort of why sort of I didn’t want to do it. If I could find a way of doing it that it really wouldn’t be, to me I just haven’t never heard much by way of instrumental that I think that it’s great. The only one I’ve ever heard that was able to do it well not the only one’s but one of the only artists I’ve ever heard do it was and in a great interesting way is Nuno Bettencourt. yeah, I heard that was great and he put on a great show and was amazing in it. John those are my questions you’ve answered every single one of them that I had for you. I appreciate your music with Dokken I’ve followed you since you’ve been kind of creeping in their 1998 – 1999 then you came in in 2003. Are you guys going to be out on the road after the overseas thing? We’re back out, we’re not stopping, I’m leaving next Thursday. Alright well, fantastic, I hope to see you guys down here if you guys are hitting in Florida down here and all that, I’ll definitely reach out to you guys. Yeah, you play excellent guitar with Don and you put on a fantastic show. You’re definitely one of the elite guys out there. Thanks so much, I really appreciate your call and I appreciate your time. Previous Previous post: Marcelo Souza, The Next Guitar Legend?